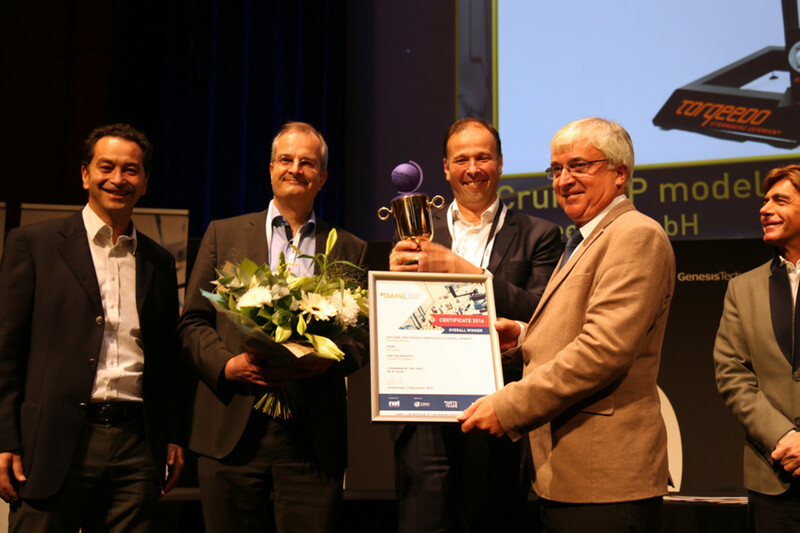 Electric marine engine manufacturer Torqeedo GmbH received the overall 2016 DAME Design Award today at the METS Trade Show. Photo by Gary Beckett. AMSTERDAM — The world’s largest marine equipment trade show, METS Trade, opened today at RAI Amsterdam in the Netherlands to large crowds amid cool, rainy weather. More than 22,000 professional exhibitors are expected this week for what is billed as the largest METS Trade ever, featuring a record 1,471 exhibitors. The show opened with a morning breakfast briefing that offered attendees an overview of what they can expect at this year’s show. Winners of the seven categories of the 26th DAME Design Awards for innovative design were announced, including the winner of the overall 2016 DAME Design Award — electric marine engine manufacturer Torqeedo GmbH. Torqeedo took top honors for its Cruise FP range of electric sail drives. Torqeedo also was the winner in the Machinery, Propulsion, Mechanical and Electrical Systems and Fittings category. Clothing and Crew Accessories — Zhik Pty Ltd. for the water-repellent fabric technology in its Zhik line of performance watersports apparel. The DAME Design Award competition attracted 117 product submissions from companies in 26 countries; 67 products made the list for final consideration. In addition to the category and overall winners, 22 products received special mentions. “The fact that we have awarded category wins and special mentions to so many products this year illustrates the high quality and broad variety of entries from across the globe that were offered for consideration,” DAME Jury chairman Bill Dixon said in a statement. METS Trade donated all entry fees from the Design Award competition to the charitable organization Amref Flying Doctors, which will use the funds to promote better health for girls and young women in a remote part of Tanzania, as well as provide the community with a new water source. RAI Amsterdam executive vice president Ids Boersma presented a check for 17,500 euros ($18,782) to Sylvia Castelijn of Amref Flying Doctors during the award ceremony. Stephen Beckers, president of the Implementation Centre for Circular Economy in Brussels, was the keynote speaker at today’s breakfast briefing. Photo by Gary Beckett. 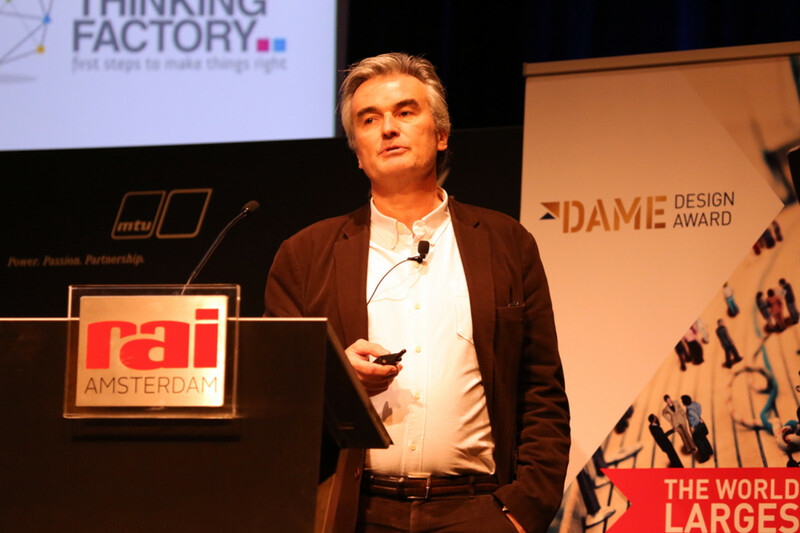 Stephen Beckers, president of the Implementation Centre for Circular Economy in Brussels and a founding partner and chairman of Lateral Thinking Factory Consulting, delivered the keynote address at the breakfast briefing. Beckers offered an overview of the “circular economy,” in which resources are used for as long as possible and products and materials are recovered and recycled at the end of their service life, rather than simply being disposed of as waste. He offered several examples from other industries showcasing how the “circular economy” not only positively affects the environment, but also caters to the growing “sharing economy” trend in which users rent or share products rather than own them. “There is no reason why you should own the engine in your boat, just like there is no reason to rent the lift in your building,” Beckers said. He concluded with a pitch for upcycling products such as boats that can be designed for disassembly and later broken down into valuable raw materials. Beckers also demonstrated how the circular economy can benefit the corporate bottom line.